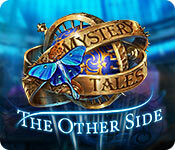 Mystery Tales: The Other Side is rated 3.3 out of 5 by 10. Rated 5 out of 5 by Prof_Apolant from Challenging Game With A Sci-Fi Twist! Glad I ignored the negative reviews after playing the demo, because this game turned out to be exactly what I've been looking for. The premise was unique - an evil space entity is basically using a local TV company to harvest souls. We pretty much have that figured out from the beginning, but there are several unexpected twists and turns along the way as to who is helping the demon. I'm a fairly jaded gamer, but this held my attention, and I have to say that I really enjoyed the plot line, which was a decided relief from all the pagan/witchcraft elements that have insinuated itself into Every Single Game Ever by this point. Some fairly complex logic puzzles with a sci-fi twist about sums it up. No spellcasting, Druidic runes, ancient curses, etc. Perfect if you're in the mood for something different/challenging. Rated 5 out of 5 by elemare from This game gave me the puzzles I crave I have no idea what game the other reviewers played, but this crazy game gave me the puzzles I crave. Lots of them. I like a good story, but not too much of the story and cut scenes - for that I'll watch Netflix. I want a story that makes sense for the puzzles that are presented. These puzzles are different, can be hard or easy, are clever, and appear deceptively easy, but hold on - think before you click. They are NOT typical or plain ol' HO lists. Finding artifacts and coins adds another dimension, too - keeps you alert, and busy clicking on random objects for fun morphs and animations. I found the game rather intuitive, too - you know what to do next, which is unlike some recent games where I have to click hint because there is no clear or logical path forward. It has enough (awkward) humor that I chuckled once or twice. Bought it as soon as the trial was over. Rated 5 out of 5 by biscuitsmama from FREE TELEVISIONS ALWAYS COME WITH A HIDDEN COST Would you accept the gift of a TV set if one was offered to you? You receive a call from a colleague who has recently returned home and in the past month many of the town’s residents have mysteriously died. The only common link in all of the cases is that the victims were in front of their TV sets when they died. 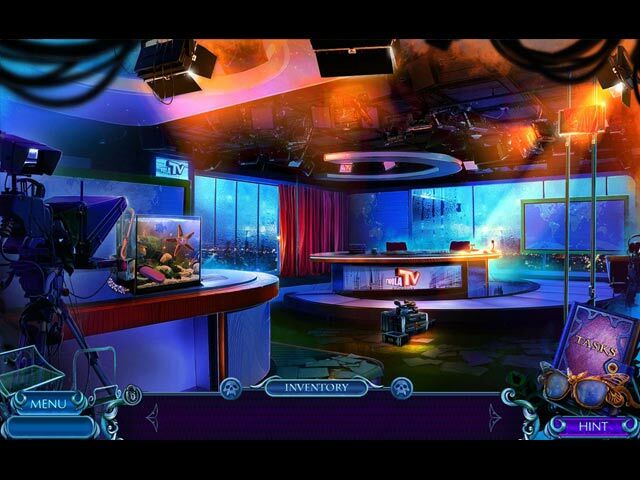 It looks like this case is right up your alley as an investigator of paranormal events, so you grab your trusty glasses and off you go to solve another mysterious case. As far as the technical stuff for the game, I think that the actual game is better than the beta and it looks as if the developer fine-tuned and sharpened up the graphics somewhat in the full release. The game has all of the things that we are familiar with in this series and the most important being those old school winged glasses that will allow you to see past events and pick up certain tools that are not otherwise available. HOP scenes are a mixed bag as far as variety and are basically okay but nothing too different. The mini-games are very easy but what I appreciate most is that they come with the ability to choose an easy or hard setting so that you can select the difficulty that most suits your gaming needs. When the CE version of the game was released, I gave it a bad review because I was so put off at having another game with the evil demon theme. However, one day when I needed something to play I decided to put my dislike of the theme aside and give it a go. Well something surprising happened and I ended up really loving the game. There is a lot to do and find and a lot of intricacies in the game that I didn’t notice early on. I will most likely replay this game simply because there is a lot to do and it took me a long time to get through it the first time. My apologies to the developer for my review of the CE because this turned out to be an excellent game and one that I truly enjoyed. As always, I recommend that you try the demo and if you happen to see my review of the CE, please know that this game does not warrant that review. Happy gaming! Rated 4 out of 5 by ninja226 from Too much TV could kill you But playing video games will exercise your mind. LOL. This is a really well done game. 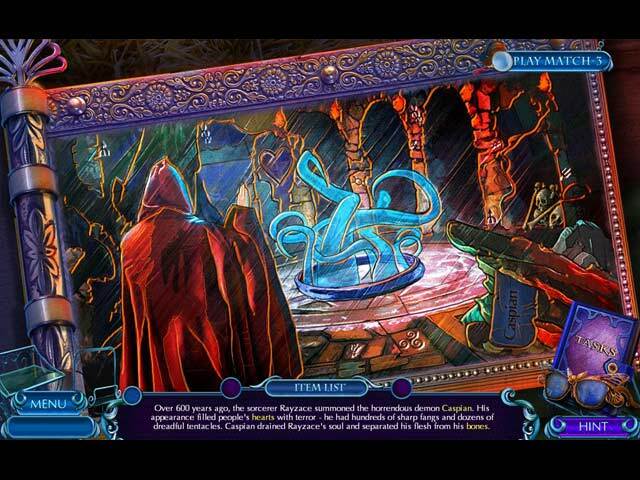 The story is told in flashbacks by putting on your magic glasses (bottom right) when you encounter a ghostly blue glow around a character. The game is really long with an equal mix of HOPs and puzzles. You can opt for match 3 instead of finding HOs. No morphing objects, but lots of interactions in each HOP. The puzzles are varied, and manageable except for a couple. Each puzzle has option of easy or hard. Expert mode disables Hint and Skip, but helpful messages and active task areas on the map remain. I really enjoyed playing detective in this game, as the actions to take are easy to intuit (unlike some games). Following the story is straightforward, but the leitmotif is pretty stale (the bad character makes a Faustian pledge with a demon to gain unlimited power, wealth, beauty etc by selling their soul or capturing innocent souls as sacrifice to the demon). The artwork is very well done and excellent, just shy of being super high def. Not sure why this game doesn't have better reviews. I think it is fantastically well done and a real value. Rated 3 out of 5 by Kimmycoo from It was ok The story line was silly but I liked the game regardless. It wasnt anything special, it was all just so so. I wish that HOG would morph with the times and become more grand. More PS4 looking. Newer puzzles and HOG scenes. More logical story lines. Im tired of magic and Im tired of mist. Rated 2 out of 5 by catmartie from What? Where? Other reviewers have taken the trouble to describe their problems with this game, and I agree with them. My - possibly additional - problem is that I can't settle to enjoy a game if the most basic elements jar with me. So, where is this story supposed to be taking place? The characters all have American accents, there is an American mailbox at the scientist's house, there is a Police "Department", complete with guns lying around - as well as the unfortunate hamster, of course, with his frozen dry food, there are various landmarks seemingly to be found in an American town with an American name, yet we have a right hand drive car and police officers wearing a pretty close approximation of British uniforms; this is most likely why trying to contact them by dialling 911 didn't work. No, sorry, I can't achieve any suspension of disbelief on top of everything else. Rated 2 out of 5 by bessiegirl from Not a smooth game Never even finished the demo. I found myself just clicking through and bored. Awkward game that did not flow smoothly. Graphics were dark and comic book like. A lot of puzzles so you didn't get far in the game without being interrupted with one which made the game slow and a bit clunky. Puzzles were not well explained and annoying...things seemed to lag. Can't put my finger on it, but it just didn't grab me. Way to many cut scenes and those ridiculous glasses...some things didn't even make sense. Not even worth a game credit for me. Rated 1 out of 5 by Granny_Gruff from Puppy Shovels and Hamster Chargers! Free evil TVs, people dying, demons want to come back to life, and you get to investigate. That's pretty much the plot in a nutshell. Good stuff: The artwork on the car interior in the driving scenes was good. You do get to choose between easy and hard on mini-games. Bad stuff: Domini Games has killed logic, buried it, and put up an engraved monument. I figured this out in the police station, right after I got the hamster food out of the frosted minifrig and the hamster charged my batteries for me! Don't ask what it took to open the first aid kit. We would both be sad then. Just in case I wasn't sure that logic was dead, I entered Professor Landon's lab, where I had to freeze the refrigerator lock with Nitrogen, hunt up a hammer to break the frozen lock, mix ingredients into rust remover, use the rust remover on a locked box in a locked cabinet in another room, take the hint for the sprinkler system out, use the hint on the sprinkler puzzle, to finally put out a fire started by a demon! I'd already fed the professor's hungry puppy with a single bare bone, taken him outside to bury it, and had the puppy dig the bone's hole right where I thought something was buried. (As a player, I was right, but illogically unhappy in reality.) 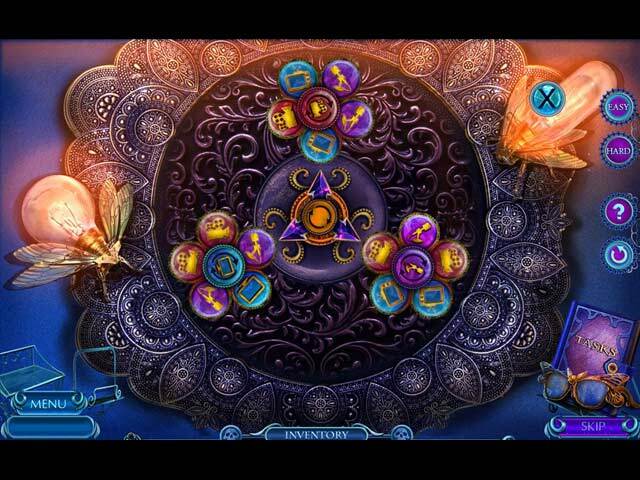 Add the fact that the artwork is still over-colored and tends to fuzz out in psychic scenes and between locations; that you will have to perform a whole list of trite actions seen in most other games; that the majority of puzzles were more exercises in placement than intellectual challenges; and Domini has at least one unhappy player - me. Bottom line: Even the usual cheerleaders aren't happy with this game. It's not the story so similar to other recent games - it's the horrible execution of the details. Please check out the demo. What you buy determines what you see in the future. Do not encourage bad gaming!